A Chinese Singaporean chef formerly working in Tokyo, finds himself in Okinawa begging a disgruntled old chef to teach him traditional Okinawan food. A top Japanese food critic finds herself in Singapore on an eye opening discovery of SEA cuisine. In reality both are looking for each other after an emotional breakup years ago when she left him without a trace. 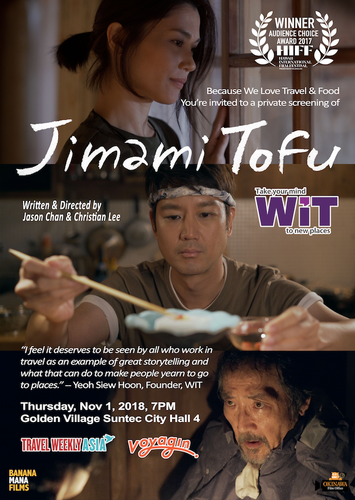 Emotionally crippled by their breakup, he searches her home-town for her but discovers instead the art of traditional Okinawan food and her childhood best friend. He learns the incredible balance of two cultures: Chinese and Japanese—the homely, warmth of Chinese style cooking with the artistry of Japanese cuisine: a balance they never had in their relationship. Family secrets also unravel and when she suddenly appears in Okinawa looking to find closure he cooks and serves her their final meal. Through it she discovers what she has been yearning for all these years.